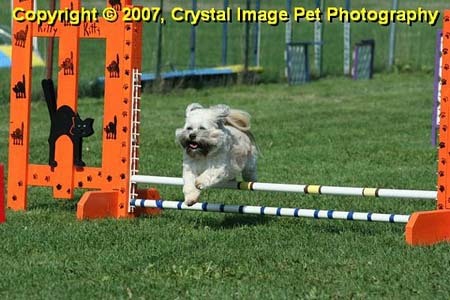 Hi Debby, Julie, attached are shots from our last CPE agility trial, end of Sept., St. Cloud, MN. Roman did really well on the Saturday, getting some Qs in the games and jumpers, one standard course. Sunday was very hot, we did ok but needed a 2 hour cool down in the car with the ac. Roman is starting to do the weaves with enthusiasm, and a little hip hop through them. The picture of the shute, he’s not going through, but backing out. That’s an obstacle we need work on. Everyone was laughing, I didn’t get it until after the run. The photographer said he went through half way, then did a perfect straight line reverse. Leave it to a Lhasa to have some creativity. Use any photos, permission given by crystalimagepetphotography.com. Thanks for your time. Mary R.
Be sure to scroll to the bottom of the page to see the rest of the photos. Mary, is the black cat theme on the uprights simply for fun, considering the season? What about the candy weaves? I am so impressed! What a dog, and what a great trainer! I have thought that Zeke would make a great agility dog, because he loves to leap and go under and over and have fun, but I am at a loss as to how to even begin to train for these types of things. We are working on simple obedience right now, on leash. He does everything very well, on leash, for treats, but off leash it’s “if I feel like it”. I gave up on the clicker because I couldn’t manage leash, clicker, treats and Zeke with only two hands, but if Mary says that is a good way to train, then I’ll go back and try again. Any advice or suggestions on training Apsos, Mary? Especially on how to get them to “come” reliably? For his own safety, that is the one thing I really want to teach him, and my old, heretofore “proven” methods are not working as well as with past, non-Apso breeds! Thanks, Mary, for the advice and encouragement. I have both Pat McConnell’s books you mentioned and am using her “Power of Positive Dog Training” as my guide.I think it’s the best dog training program I’ve ever come across. And Zeke is doing pretty well, all Apso things considered. Like you say, Apso’s are not like many other dogs who really take to obedience. I had standard poodles in the past, and they are certainly different personalities! He is his own little man and, and like some two year old humans I’ve known, I let him do things “his way” when the outcome doesn’t really matter. But learning recall is one of those thingss that really do matter. I have always used the “positive reinforcement” method to teach “come”, but have learned so much more from Pat McConnell. There are not many dog obedience clubs or rally events around here (Edgewood, NM) that I’m aware of, so just doing “at home” training will probably be our main focus. The town of Edgewood offers obedience training, but it’s the compulsion method, and for that and other reasons, we won’t be participating in their program. Still, like you say, it needs to be fun for him. And he gets very excited when I ask him if he wants a “lesson”; (I’m sure it’s the treats!). So we will keep after it and continue with the fun and games attitude. And I went back to the clicker and am learning to manage it all, especially since Zeke is doing better with his training. He has lots of “bad habits”, like jumping up on people and that’s going to be a hard one to deal with, since he gets lots of “positive reinforcement” when people give him attention for doing so. He’s just so darn cute! Thanks! And Congratulations to you both!